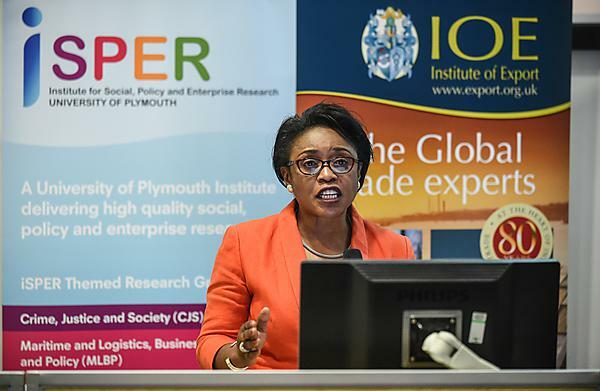 The need to do more to improve the UK’s export competitiveness was discussed at a recent trade summit at Plymouth University organised by the Institute of Export (IoE) in partnership with iSPER. Businesses from across the South West attended the summit and heard from a range of speakers, including the keynote Lord Stephen Green – the President of the IoE and a former Minister of State for Trade and Investment. Lord Green outlined how the UK’s current account trade deficit (at 5 per cent of GDP) is the largest of any developed economy, thus emphasising how the UK needs to improve its export performance. Speaking at the event, iSPER’s Dr Lise Hunter (pictured), outlined the UK’s relative position in the “Enabling Trade Index” and noted how it needed to be improved. As another iSPER speaker Dr Walmsley pointed out the UK currently exports more to the Republic of Ireland than all the BRIC countries combined. In order to address these issues, iSPER’s Director, Professor Jingjing Xu, spoke about the need for businesses to engage more with the universities in the post-Brexit era – highlighting the potential role academics can play in helping develop innovations and negotiating what will be a new policy/regulatory environment. In particular, she emphasised the sheer variety of expertise and potential collaborative opportunities available for businesses at the University. Similarly Dr Walmsley, highlighted the importance of ensuring graduates have the skills and mind-set required by businesses. In recognition of these issues, the University of Plymouth’s Vice Chancellor, Professor Judith Petts, who opened the afternoon sessions, outlined how the University is already across the South West to support start-ups, share academic and student expertise, and boos innovation. The event was also notable for a number of international speakers including Siddharth Mukne, the Regional Head at UK India Business Council and Iman El Sherif, from the Egyptian-British Chamber of Commerce. Meanwhile, Stephen Dilley from Bond Dickinson discussed how businesses should prepare for Brexit, while Miles Carden from Aerohub Cornwall highlighted the significant place the space industry takes as a key contributor the South West economy. Further information can be found in the IoE’s Event Report. This is also an article on the event in the Plymouth Herald, based on an interview with both Lord Green and iSPER’s Director Professor Jingjing Xu.